Klotzbach et al (including two Pielkes and a Christy) have recently written an interesting paper which, if correct, helps to align the satellite and surface temperature trends. Now I know that the IPCC claimed that these were already consistent "within their respective uncertainties" but it seems to me that the warming ratio of surface to altitude observations is a little on the low side. 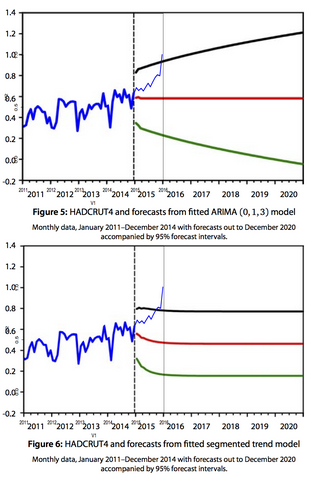 Recall that climate models suggest a ratio of about 1:1.2 for this, but the observations are close to 1:1. Maybe there is enough uncertainty for the 1:1.2 value to be correct, but it seems to be stretching things a little. I'm not an expert on this, but have been aware of RPSnr's papers on this topic for some time now and I can see the logic in his argument. Although I frequently disagree with the spin they put on things (and there are some red herrings in their work, like the Eastman paper that mt mentions here), I do not reject all that the Pielkes say out of hand. I do, however, note that others have recently objected to some of the work which is cited in this new paper. So, Klotzbach et al argue that the night time minimum temperature at the surface have, at least on still nights over land, warmed up more than expected (ie compared to a normal lapse rate) due to various radiation-blocking effects. So what does this actually mean? Well, one thing it does not mean is the main title of RPJnr's post, that the surface temperature trend is overstated. There is nothing in the paper (despite three gratuitous plugs of Watt's photography site) that actually argues for the measured temperature trend being wrong in any way. Rather, the paper explains why the measured trend is a bit greater than would be expected (according to mainstream theory) in comparison to the satellite measurements. Instead, RPSnr is presenting the claim that the surface temperature trend "overstates the magnitude of climate system heat changes". Since it was primarily RPSnr who was pushing the meme of defining global warming through heat content rather than temperature, I don't think the rest of us need to lose much sleep over that one, but I can see why he might be perturbed. Basically all of the downstream impacts-related application of climate modelling is calibrated on temperature rather than integrated atmospheric heat content (tropical storms may be one exception) so all he seems to have shown is that his preferred metric is even less useful than it at first appeared. Of course being the political scientist that he is, RPJnr is dropping the crucial rider and simply presenting the claim that the trend has a high bias. That transforms the claim from irrelevant to wrong. The warming trend is what it is, and even if part of this is due to heat moving around rather than accumulating, it is still a warming at the surface. "The topic of your post is the "temperature trend" and specifically you claim that the surface temperature trend has been overstated." No. The title of the post is "Evidence that Global Temperature Trends Have Been Overstated". It might have been more accurate to write "global atmospheric temperature trends" but it clearly does not say "surface temperature trend" as you allege. So enogh with the word games, OK?. Huh? If the supposedly "overstated" "Global Temperature Trends" are not specifically those based on the surface measurements, then at this point I have absolutely no idea what he thinks he is referring to. Unlike Roger, I don't think that it is particularly fun to play semantic games on blogs, so I won't continue further. Oh, and xkcd, via thingsbreak at init. Let us, as they say, follow the heat. Assuming that heat injected into the system is restricted in some way to the lower part of the atmosphere, this means that MORE heat will move into the oceans. Since the heat capacity of the oceans is many times higher than that of the atmosphere, in part or whole, that means there will be MORE surface warming. >"Instead, RPSnr is presenting the claim that the surface temperature trend "overstates the magnitude of climate system heat changes". Since it was primarily RPSnr who was pushing the meme of defining global warming through heat content rather than temperature, I don't think the rest of us need to lose much sleep over that one, but I can see why he might be perturbed." If your interest happened to be temperature trend at 50m or maybe soil temperature trends, then you might be with the Pielkes in saying the 1.5m surface temperature record is biased warm. However, I would agree most people would be more interested in Co2 being less responsible and land use changes more responsible for temperature trend. Eli, who said anything about 'heat injected' rather than different mixing? Also, if the reasons for different mixing is caused by things like roughness of buildings, would there be much effect on temperatures over oceans? "the suggestion of a warm bias in the surface temperature record not only passes the tests that we apply, but they provide further evidence in support of of my father's arguments. Score (another) one for Dad." Well who's he talking about then? If you are searching for coherence in what he said I predict you will be disappointed. I'm just searching for any evidence of shared DNA sequences at this point. but it clearly does not say "surface temperature trend" as you allege. So enogh with the word games, OK?.Huh? If the supposedly "overstated" "Global Temperature Trends" are not specifically those based on the surface measurements, then at this point I have absolutely no idea what he thinks he is referring to. is that he thinks James is just playing word games with him so he is entitled to play word games back and the complaint is that James has said surface temperature record when James really meant 1.5m temperature record and surface temperature means temperature of the ground not the air 1.5 m above it. If this is the complaint, I think this surface vs 1.5m is just a word game and can be ignored. not invalidated 1.5m temperature trend but that, if this is used to estimate heat content, it results in a biased high estimate of heat content. I think this is more substantive issue than just being a word game. This interpretation is probably wrong - I usually am about this sort of thing. It does seem that it is largely only the Pielkes that care about heat content as a global warming metric. Of course people studying oceans may care more about heat content trends than 1.5m temperature trends but that isn't most people and really isn't the issue. Crandles, help me out here. I'm not clear on how the significance thresholds in table 2 and 3 (sat/surface differences) were calculated. For instance, Table 2 has UAH-HadCru and UAH-NCDC (with no amplification) as significantly different from 0 at 95% confidence. Yet each data set's central estimate trend is within the other's 95% significance bounds (Table 1). In other words, the uncertainty range of the trend difference is lower than the uncertainty range of the trend of any of the data sets. I agree that such a situation is relatively unusual, but if the uncertainty in the trends is due to weather noise which is the same (or very similar) in both series, then subtracting one from the other may give a residual with less noise and thus lower uncertainty in the trend of the difference. The trend figures they plot in their paper seem to support this. Yes, it does seem the standard error for trend of differences (UAH-HadCRU) is slightly lower than HadCRU trend itself. I get -0.33 +-0.34. So I guess the tie goes to the runner. Of course, there is also a significant trend in differences between UAH and RSS: -0.031 +-0.012. Hank wanting my help?? I am probably talking rubbish. was that he has heat content so ingrained as his metric of heat content and he has (whether consciously or not) thought it is so obvious that he is talking about global warming that it isn't stated. But he doesn't feel the need to explain it that way. Then having got that far, and been challenged by several people on precisely this issue, there seems a preference for pretending they can't see the obvious rather than admit it is badly explained. Personally, I completely disagree: The paper if anything shows a need to be aware of different temperature trends at 1.5m vs ground temperature trend vs 50m temperature trend. Therefore it is showing that it is impossible to have a single metric of global warming and therefore heat content as the metric is a bad idea. Anyway they probably aren't as stupid as me and, as I said earlier, this interpretation is probably rubbish. oops make that so ingrained as his metric of global warming. Hank, if you were still talking about the 'surface'bu in that quote, then yes it does appear to be him making the same 'mistake' as James. But if the accusation thrown at James is just a silly word game to distract attention who really cares if he makes the same non-'mistake' as James. The idea is that I spend several days commenting on his blog pinning down this irrelevant nonsense while Roger brings up as many red herrings as he can, interspersed with the sycophantic peanut gallery lobbing in random septicisms, and everyone conveniently forgets the point that the blog post misrepresents what the paper actually says (even assuming the latter is correct). Which is why I'm not playing his game. I note that on that comment thread, even regular sceptic supporters Mark Bahner and Ron Cram agree that the use of the term "bias" is wrong. Er, "non-standard, and tends to cause confusion" and "imprecise and leads to confusion" respectively. Roger accuses you of snark. Not that he would ever behave in a snarkish fashion. Of course not. Aw, the poor diddums, he's a bit precious, don't you think? As for snark, I plead guilty, but hardly more so than RPJr himself (in that very post, no less). Incidentally, I recall that someone a few years ago was quite scathing (via email) of Pielke and Matsui as being based on a false premise, this did not reach the level of an public comment but may explain why it (and the subsequent Pielke-science) has made such little impact on the field. At this point RP Sr.'s voluminous output isn't doing much beyond feeding the denialosphere. I don't quite understand why RP Jr. thinks it won't hurt his own effectiveness (e.g. in being invited to testify to Congress) to be involved with it this closely, but perhaps the family tie trumps that concern. More broadly, there does seem to be a bit of a surge in denialist publishing and media activity, which I suppose can be chalked up to Waxman-Markey and Copenhagen. I suspect that standing as a totem for the peanut gallery is a great way of getting invited to Congress! Sure, but it ruins his act to get called as a Republican-only witness (and get lumped in with the likes of the potty peer and Bob Carter). He backed out of at least one such hearing within the last couple of years. Pielke and the Breakthrough Institute made a certain amount of sense back when the Republicans were in control, but now they've passed their sell-by date. So is this anything new about resolving short term rapid change in temperature spikes of the sort XKCD doesn't show? Records from drill holes in the eastern equatorial Pacific indicate that Earth’s orbital eccentricity played an important role in controlling climate as the planet warmed. But anyway, no this is not really concerning "rapid" changes, they are only rapid in comparison to very long term evolution of the climate. It's not a surprise there are climate cycles linked to orbital variation, it's an achievement to find them in cores of such a great age though.